US President Donald Trump has signed a new order that boosts sanctions against North Korea over its nuclear weapons programme. The US treasury has been authorised to target firms and financial institutions conducting business with the North. The president also said China's Central Bank had instructed other Chinese banks to stop doing business with Pyongyang. It comes less than two weeks after the UN approved new sanctions against the country over its latest nuclear test. Tensions have risen in recent weeks over the North's continued nuclear and ballistic missile tests, despite pressure from world powers to stop. Announcing a new executive order on Thursday, President Trump said the measures were designed to "cut off sources of revenue that fund North Korea's efforts to develop the deadliest weapons known to humankind". He singled out the North's textiles, fishing, information technology and manufacturing industries. "For much too long North Korea has been allowed to abuse the international financial system to facilitate funding for its nuclear weapons and missile programs," he said. He stressed that the sanctions were targeting "only one country, and that country is North Korea". His treasury secretary, Steven Mnuchin, later told reporters: "Foreign financial institutions are now on notice that going forward they can choose to do business with the United States or with North Korea, but not both." The US president had on Tuesday vowed to "totally destroy" the North if forced to defend itself or its allies, in his first address as US president to the UN General Assembly. North Korean leader Kim Jong-un vowed to make Mr Trump "pay dearly" for his speech. In a statement on Friday, he branded Mr Trump "mentally deranged" and said the US president's remarks "have convinced me, rather than frightening or stopping me, that the path I chose is correct and that it is the one I have to follow to the last". Taking an indirect swipe at the US, Russian Foreign Minister Sergei Lavrov warned the UN that "military hysteria" over the North's nuclear testing would lead to "disaster". China's Foreign Minister Wang Yi told Pyongyang not to go in a "dangerous direction", and told the UN General Assembly on Thursday that there should be no new nuclear weapons on the Korean peninsula "whether it is in the north or the south". What missiles does North Korea have? How do you defend against Pyongyang? Meanwhile, South Korea's president, Moon Jae-in, met Mr Trump on the sidelines of the UN General Assembly - an annual event, bringing together leaders of the UN's 193 member states. Earlier, Mr Moon said his country did not want the North to collapse, nor does it want an enforced reunification of the peninsula. But he said sanctions were necessary to bring Pyongyang to the negotiating table and force it to give up its nuclear weapons programme. The latest UN sanctions - which came after the North's nuclear test on 3 September - restrict oil imports and ban textile exports, in an attempt to starve it of fuel and income for its weapons programmes. It is the ninth round of UN sanctions to hit North Korea since 2006. 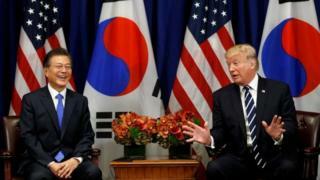 The US has been imposing sanctions on North Korea since 2008, freezing the assets of individuals and companies linked to its nuclear programme, as well as banning the exports of goods and services to the country. 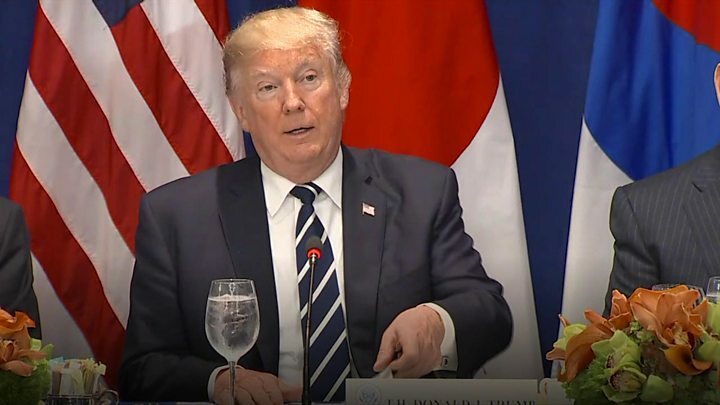 In his comments on Thursday, President Trump praised China, one of North Korea's closest trading partners, saying: "Their central bank has told their other banks, that's a massive banking system, to immediately stop doing business with North Korea." However, a spokesman for China's foreign ministry, Lu Kang, later said that Mr Trump's comments were inaccurate. "They do not accord with the facts," he said. It is not clear if a misunderstanding has occurred in relation to China's banks being ordered to immediately cease doing business with Pyongyang or whether China's central bank has agreed to a gradual withdrawal from the market. Does China have any leverage? None of the latest sanctions are believed to include any ban on oil imports to North Korea, which China continues to resist. Three days after the UN's punitive measures were approved, Pyongyang fired off a second ballistic missile over Japan - its furthest-reaching yet. European Union officials have also revealed plans to impose fresh sanctions against the country, but a decision is unlikely to be taken until the middle of October. Experts say North Korea has made surprisingly quick progress in its development of long-range missiles and nuclear weapons. What are North Korea's other WMDs? Video Was your T-shirt made in North Korea?